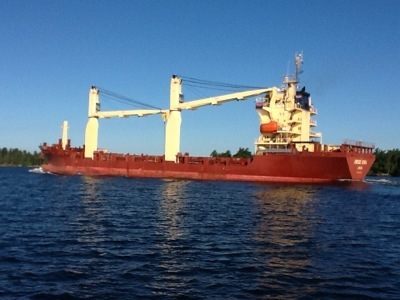 We left Alex Bay at around 7:30 – the winds had died down so it was easy to get off the dock. It was an uneventful trip down the river but we did get to see a few interesting things. 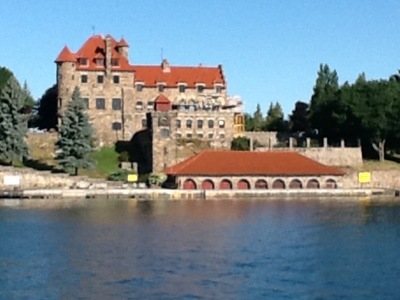 The second picture is of the Singer Castle – it is not as large as the Boldt Castle but very impressive and it is completely finished. We went by too early to tour it and were in a hurry to get to the first lock. We got to the Iroquois Lock just after lunch and noticed that the doors were just opening, so we quickly docked the boat and Dennis hurried up to the ticket booth and paid the $25 fee. We got the green light and moved into the lock. It was so uneventful that might I actually say it was kind of boring? No towing boats or engine fires? AND, we only went down 19 cm. 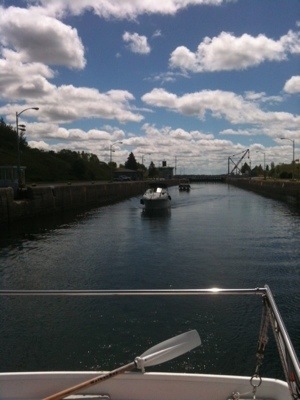 I didn’t even realize we had finished when the lock master asked for his line back – we were still at the same height! Oh well, sometimes boring is a good thing! 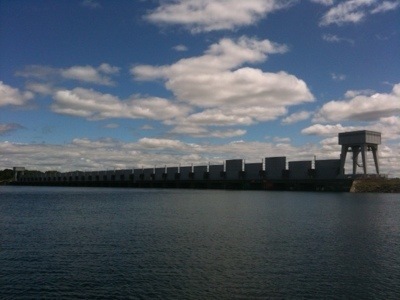 The picture above is of the water control area – the lock is in place to help control the current which did pick up considerably once we were clear. It only took an hour and a half to go the last 12 miles.